Hi There, nice to see you. Luke’s knowledge of how digital communications work just drew you to click through to this site and see what was going on. Not bad for a single line of text. Maybe the next step is to invite Luke up for a conversation about why it worked, and how we can leverage such simple but powerful results. This entry was posted in Uncategorized on August 2, 2016 by lukejh. 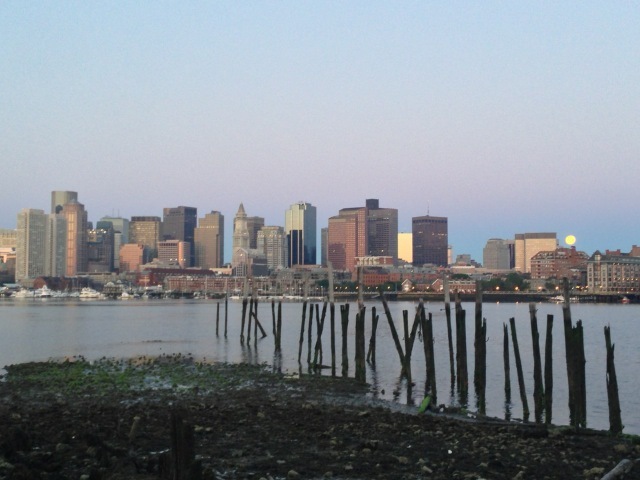 This interview with Rajesh is a crosspost from the Berkman Center for Internet and Society, where I was honoured to interview one of their incoming fellows Rajesh Veeraraghavan. We spoke about his work in transparency, ICT, and democratic governing. Transparency continues to be a buzzword that carries multiple expectations in terms of democratic governance, participation, and anti-corruption measures. Your work seems to cut through the buzz to zero in on decentralized experiments that show how these concepts materialize in the ‘last mile’ of civic/social/political life. Can you share how you came to find this space, why you thought it was an important interaction point to focus on, and what you discovered? I am beginning to think that at the heart of the “open” governance story that I studied is a story of democratizing surveillance. It brings the idea of politics, resistance and conflict to the center of the project. The recent passing of freedom of information or right to information acts in India, meant the right to surveil the actions of the state has been legislated. This reflects a certain potentiality for the citizens to see the actions of the state. Moreover, what this does to me is that with the notion of surveillance, it is not surprising to see that people (as in lower-level bureaucrats) resist it. My work suggests that the future of such informational transparency government programs lies in recognizing that the move towards “openness” is more of a political project than a technological and bureaucratic one that needs wider participation from those it intends to benefit. LH: The concept of the ‘social audit’ is fascinating. Can you expand on that: how do you see them as important to functional democracies, and what do you see the role of information communication technologies in social audits in the unique ‘last mile’ contexts of developing and developed (and possibly more apathetic) nations? RV: Social audits are a tool that lets groups see the workings of the state. It is a way to democratize surveillance of the State. What is involved here is that more people are brought in to surveil the actions. In the context I studied, the workers and the auditors enter the fray here. So, the project is about democratization of surveillance, with a set of preconditions making it possible and also there are limits to achieving it. For example I find that there are definite limits to the interest of the worker in participating in the surveillance. With all the talk in the world about surveillance by the state dominating our attention, there are possibilities to turn the gaze back on the state. There are limits to this of course. It is a terrain of struggle. The result is a partial “openness.” Therefore it is easy to see why projects with purely a technical imagination of building tools to visualize or asking for more records to be up on a website, which is increasing openness, do not let us understand the issues at stake. In other words, talking in terms of “openness” is not letting us see the issues clearly. Instead, I am beginning to consider a critique of openness, in that there are actors who are interested in seeing actions of others to control them. Openness is thought of as good for all. Hence the metaphor of sunlight. But, I think this utopian vision has unfortunately led to stripping politics out of the discussion. Thinking of open governance as surveillances makes it a more political, relational concept. An even better metaphor to consider might be a flashlight. Using the flashlight metaphor, immediately brings up things like there are people who are holding the flashlight, they are focusing on certain aspects of the process, and there could be people who will resist and move out of the gaze. There is also the process of building better flashlight through information technology to increase the ability to surveil. LH: Your point on stripping the politics out of openness and transparency (i.e. by/for whom, and why) seems very salient when we think of not only the various stakeholders and issues, but even the expectations of how democracy functions or should be ‘performed’. By this I mean, openness to some can mean reducing asymmetries of information, so that the market of ideas can make precise choices (by voting), while to others, openness can mean the participatory interaction that seems to be happening in that ‘last mile’ of social audits, and other participative or collaborative democratic projects. Within your research, have you experienced clashes between these expectations about how democracy works? RV: This question gets at the core of what I am writing about and I have a provisional answer for you. My simple answer is Yes, there are “clashes” between the expectations and reality as you hint at. I think it suggests that we may have to add a serious footnote to the dominant theory of asymmetry of information. Like my advisor Paul Duguid is fond of saying – information is not a naturally occurring thing that can be passed around freely to fix problems. It is socially constructed. One way to think about this, is to consider what happens if there is full symmetry of information, does that automatically fix things? The notion that supplying information via more openness leads to more participation is just not borne out in my experience. Simply put politics gets in the way. LH: Finally, what is it about the upcoming projects you’ll be working on in the next year that excites you the most? RV: I am working on a project where we propose to use the existing public geographical maps to discover built infrastructure, turning the map into a starting point for material audits by working with partners on the ground. The project will rely on sophisticated technical tools that can learn infrastructure, like roads and canals, to present a likely “deviation report” based on a temporal comparison of these assets. We hope to demonstrate creating a new dataset that combines project documents with a way to integrate them with satellite map data to quantify material based corruption on a scale that was not possible before. This entry was posted in Uncategorized on July 31, 2015 by lukejh. In the summer of 2014 I had the opportunity to work and learn at Harvard’s Berkman Center for Internet and Society as a summer intern. This post appeared in a blog for my affiliate organisation in Melbourne, The Institute for a Broadband Enables Society, which is now called the Melbourne Networked Society Institute. I keep it here for posterity sake. 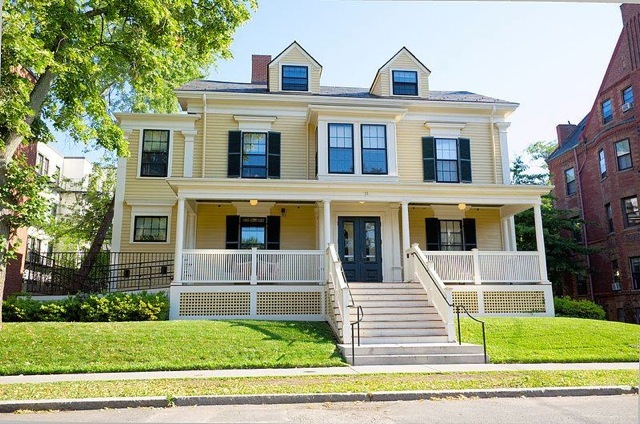 The Berkman Center for Internet and Society is a University-wide Center at Harvard that brings together researchers from around the world to share in the study, and help pioneer, the development of what was once called cyberspace. Berkman’s wide array of ongoing research projects focus on topics concerned with the development, dynamics, norms, and standards that configure how digital networks affect society. As an intern, I focussed on digital literacies and was honoured to help iterate the Digital Problem-Solving Initiative for 2014. This program brings together students, faculty, fellows, and staff at Harvard to build digital literacies and engage with research, design, and policy relating to the digital world. I also worked on projects in the Youth and Media team, which takes a special interest in giving voice to youth perspectives of digital technologies. In addition to my duties as an intern, the collaborative nature of Berkman afforded opportunities to learn from diverse researchers on a daily basis, and build relationships with other PhD candidates and Law School students who are intensely interested in making the (digital) world a better place. This community allowed productive collaborations on thinking though issues that will affect us here in Australia as much as back in Cambridge. For instance, discussing aspects of 3D printing, and how new networked additive manufacturing technologies might parallel earlier production patterns of desktop publishing, led me to write a critique of 3D printed waste for the New York Times. Overall, being able to work with and learn from new colleagues of such incredible calibre was an opportunity of a lifetime and a capstone to an exciting PhD research program at the University of Melbourne. I look forward to the new directions my research on politics in the digital – including 3D printing and privacy and transparency in the networked world – will now lead. Coordinator for Net Commnications 2014 (co-coordinated with Robert Fordyce) / 2013 (co-coordinate with Dr. Robert Hassan) / 2012 Tutor. The subject teaches diverse approaches to content creation online and its social implications. Students learn to create content with new media and critique their production from various conceptual approaches to media. Seminar Leader for School of Political and Social Sciences postgraduate Research Seminar. Head Tutor for Critical Analytical Skills 2014 (Dr. Irma Moo-Reci), 2013 (Dr. Aaron Martin). Directed active learning of qualitative social science methods and methodologies. 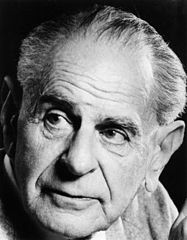 The subject engaged research from a mainly positivist theoretical perspective, highlighting the virtu(es) of falsification and descriptive inference (see KKV). This entry was posted in Uncategorized on September 8, 2014 by lukejh. This post offers some expanded thoughts from the short piece I recently had published in The New York Times‘ Room for Debate. Can desktop terminals be made “friendly” enough so that executives will use them? Should a lot of powerful machines be moved together with central libraries and thus break up traditional working relationships? Can desktop 3D printer software and hardware be made ‘friendly’ enough so that most people will use them? Should a lot of powerful printers be decentralised out to libraries, or even personal homes, and thus break up traditional working & manufacturing relationships? When thinking about the answers to those questions, remember that the paperless office was a flop, and still hasn’t turned out as hoped. Sellen and Harper’s book on the myth of the paperless office shows that, back in 2000 at least, email use actually causes an average 40 percent increase in paper consumption within an organisation. 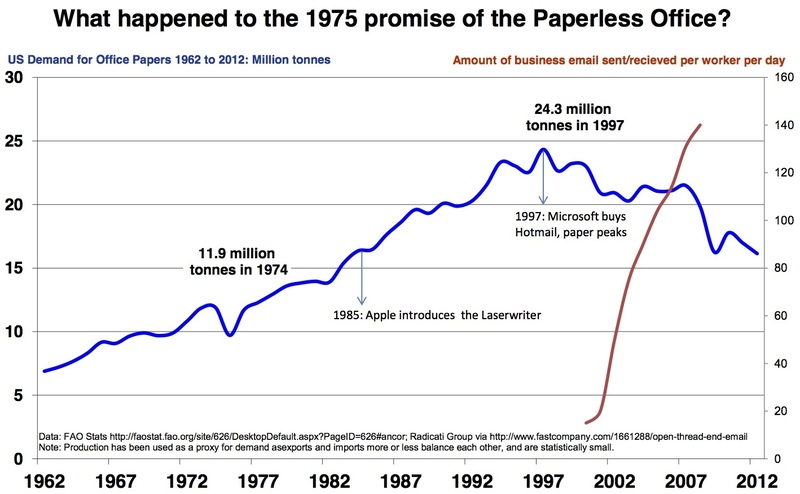 Today, U.S. businesses continue to consume more paper than they did in 1975, while an average office worker must also now deal with over 100 emails per day. It seems the purported benefits of the paperless office were indefinitely delayed via accelerating flows of information and the birth of desktop publishing. Three-dimensional printing’s utopian claims of benefit are more grandiose than the paperless office. 3D Printing advocates (and I often find myself within this tent) hope that ultra-efficient use of materials and highly decentralised production models will create broad financial, environmental and social benefits. Material and supply chain costs — both monetary and environmental — are drastically reduced by printing “whatever you need” from home. And at home, libertarians and “free culture” types alike are excited to wrestle centralised control of the (actual) means of production away from corporations and governments and into communities. But that utopian vision misses some key signs of what is to come. Remixing digital economies of abundance with physical economies — that have historically been understood in terms of scarcity — is messy. The production and consumption patterns of digital goods follow a very different logic than physical goods. For a preview, ask a digital-native how many new apps or videos they’ve sampled (and pictures or snapchats produced) in the last day. Or hour. What this means in the context of manufacturing is that for whatever amount 3-D printing successfully lowers barriers of instant manufacture, it also reduces friction for conspicuous consumption. An example: How quickly will children grow tired of their current plaything if the newest-bestest-nextest is just a click-and-print away? So, although 3-D printing may lessen commercial consumption, a homemade flood of discarded objects still might be on route to our landfills. Recycling consumer 3-D printed objects is possible. However, the laws of physics, and economies of abundance make it quite likely that measures of production will increase more quickly than the measures of efficiency. 3D printers do not make something from nothing – no matter what Cpt. Jean Luc Picard taught us. Thus, even with the highly increased efficiency of 3D printed manufactured goods, and in fact because of it, the increased amount of production will create a net environmental loss. As one last dour note, the 3-D printing recycling schemes that do exist already show familiar patterns of global inequality. For instance, social entrepreneurs suggest certifying “ethical” 3-D printing filaments that are sourced in developing nations. In this scheme, low-caste labourers pick through landfills looking for plastic scraps to sell back to the ‘ethical’ filament company. This scheme encourages the the least fortunate pick for subsistence so that the booming global demand for self-manufactured trinkets can be appeased. If the hyper-local 3-D printing revolution cometh, its design might leave the globe swimming in plastic. In short, Utopian visions of new technologies never work out as imagined, and often create unimagined consequences. Why do we think 3-D printing will be different? (Special thanks to Robbie Fjordyce, Peter Woodbridge, and Andy Sellars & everyone else at the Berkman Center for Internet and Society for guidance and inspiration. I first published an environmental critique of 3D printing on The Conversation). This entry was posted in Uncategorized on August 11, 2014 by lukejh. Online, we deal in economies of abundance. If the logic of economies of abundance that exist in digital content filter through to 3D printing, we could be awash in waves of home made plastic junk. 3D printing will continue to lower the barriers to manufacturing, which might accelerate conspicuous consumption. If production increases more than (recycling) efficiency, we’re still at an environmental loss. Also, 3D printing so far has required a ‘do it yourself’ knack for experimenting, which lived in free and open source knowledge sharing. Now, firms are providing seamless, vertically integrated experiences attached to familiar Web 2.0 monetisation models. I explore how the ease of creation comes at the expense of your control over those creations. This entry was posted in Uncategorized on January 23, 2014 by lukejh. It’s not surprising CNN knows a lot about images. Launching the 24 hour Cable News Network as an idea gave them ample opportunity to learn how to broadcast impactful visuals. 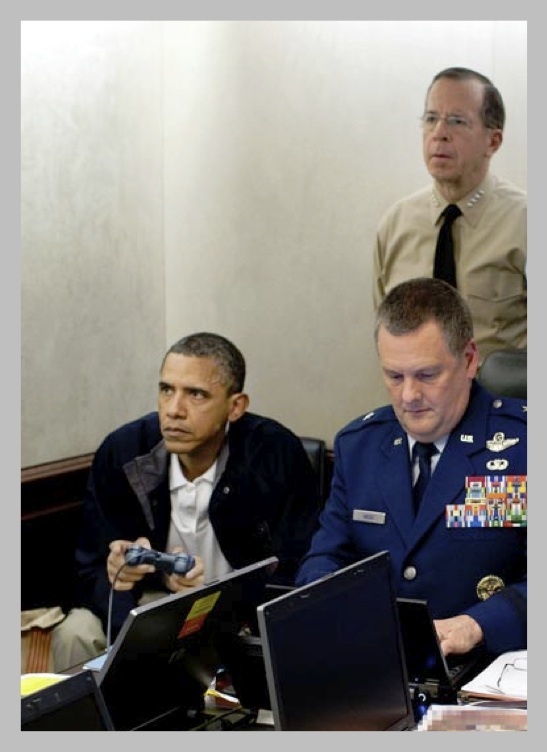 Fitting then, that John Blake of CNN dissects the O-bama-sama zeitgeist through image via the “iconic” Situation Room photo that a week after being uploaded, has become the most viewed photo ever on Flickr. Blake’s article is striking as it offers a discussion on framing in more ways than one. First, drawing from ‘the experts’ Blake attributes adroit commentary on the frames of the stories we are telling ourselves about the progression of “presidential swagger,” race, and gender. Second, and possibly instrumental to the first, is the unmentioned literal device that may contribute or allow such re-assessment to take place: a subtle change to the visual frame of the image itself allows, if you can stand the cliche, the picture to speak a thousand words. In pop culture, black men are too often seen as dangerous criminals not as guardians. Even good guys like Crispus Attucks, Shaft and Worf are not uncomplicated: Attucks is mainly known for being the first person shot by the British in the Revolutionary War, Shaft is hardly the most clean cut guy ever and Worf is not actually human, coming from a race of “savage” Klingons. Ahem. Historian Jerald Podair puts it more bluntly, noting that Obama was always careful to avoid the angry black male stereotype in his public persona, stating, as ‘protector’ he can “now appear strong without being threatening.” A ‘protector in chief’ also supplants the images of detachment, and over analysis Obama was previously criticized for. As commentators poured over the situation room image for visual clues of, body language, stature, position, height, facial expressions and even uncontrolled female exhalations, they referenced these attributes as being within ‘the image’. 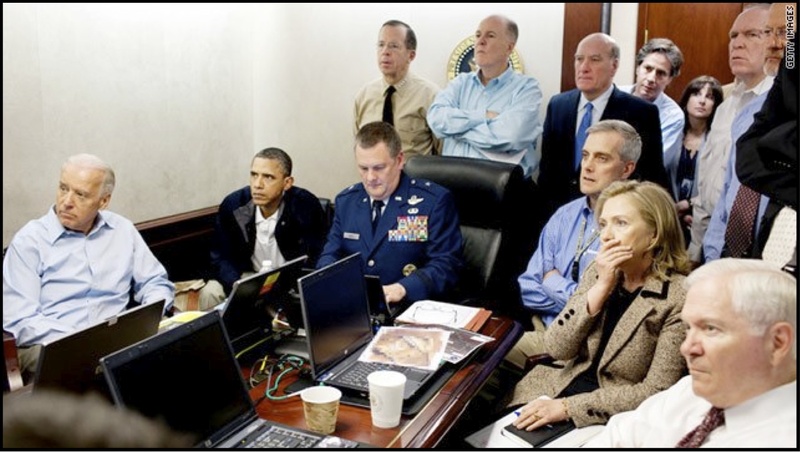 Defining the representation of the situation room as still life and singular, ‘the image’ was an object that commentators could put meaning to, or interpret meaning from, but a static thing that was objectively the same. A perfect digital, bit by bit copy, was experienced across millions of screens. Of course, electronic images of ‘digital light’ are hard pressed to be compared to still life of oils and paint; even the most simple visual editorial decisions opens up the the re-configurement of meaning for the situation room. We put genealogies of ‘digital light’ aside for now, to focus on a very simple editorial crop that literally opened up new frames of meaning. The image directly below portrays the president and his team as first supplied by the White House (see watermark in corner). This was what was shared with millions via CNN and other news outlets – you probably remember seeing it. Although Obama is not front and centre, he is squarely centred in the ‘rule of thirds’ space that our eyes focus on in photography. 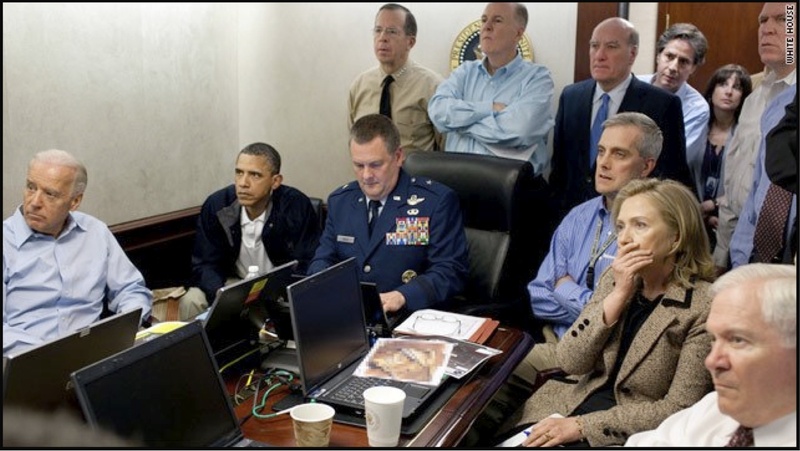 This presents him as the subject of the photo – we focus in on him in and his relation to the other actors in the situation room. The objective difference? Merely a slight, slight crop in the White House version. No different than what we’d consider in iPhoto or Facebook to help (literally) frame our photo. Note that Getty thinks the crop is important enough to watermark ‘their’ version of this US government licensed work of public domain. What is the interpretive result? While the closer crop placed Obama ‘self assuredly’ in the rule of thirds of photography, making him principle subject of the shot regardless of other elements, the full crop version removes that privilege. Suddenly his relative size, position, and posture become more apparent against other actors in the room, and the room itself. This literal frame diminishes not only his stature and ‘presidential swagger’ but the coherence of the image itself. In short, it’s not about him anymore. Visually the frame opens up possibilities of Obama as smaller and metaphorically weak, even reluctant but stuck in the corner of the shot and room, hemmed in by 8-9 larger staff with only Joe on his side. Who are these other people then? What are their perspectives? What is the photo now about? Interestingly, The full resolution version actually reveals that Clinton is the ‘subject’ in focus. The literal loss of coherence around Obama as privileged subject, and coherence of the image as a whole opens up new interpretations or metaphorical frames of what is happening. What these frames can mean as we look at the players in the room we leave to the punditry. This entry was posted in Uncategorized on October 9, 2013 by lukejh. Quick note on the interesting distinction that can be made between the secrecy that the Obama Administration gives to its drone strikes, and the current ‘live tweeting’ by the Israeli Defence Force with regard to Gaza. The Video of Ahmed Jabri being killed by the IDF in an absurdly precise air strike was published on youtube shortly after its success was confirmed. This video started a bit of a social media blitz for the IDFSpokesperson’s social media accounts. The assault on/of Hamas is being chronicled through Twitter and Facebook in a way that previously only taken up by those ‘resisting’ and using tactical media to organize their goals. The IDF’s media are a very interesting shift in war reporting and ‘transparency’ during war time: stylish infographic propaganda and live facts on the ground make for a evolving facet for infowar. Israel is able to engage rhetorical power of floating opposites (and signifiers!) through stories of victimhood of rocket attacks and retribution of airstrikes, while also sharing more general information that continues to shape perceptions as events unfold. Contrast this approach with America’s telling of its own ongoing drone strike story. Similarly targeted attacks (if ostensibly less precise) are spoken of much less often by the US Army, or CIA, or White House – if at all. And only found in hushed tones in the paper of record. American drone strikes are certainly not advertised on youtube – at least by ‘our side’. This hear no / see no ‘evil’ frame is even imbedded in the social and economic spheres of new media; ever mischievous Josh Begley continues to have his auto-mapping drone strike app rejected at Apple’s appstore gates. What would happen if your iphone received a push notification of each drone strike carried out by USA forces? Well, averaging through the last three years, your phone would buzz every 5 days or so. Each buzz accounting for about 6 reported deaths. Many points, including fading victimhood and a much longer narrative scope, makes America’s ‘transparency’ strategy for drone strikes a different game than the one being explored by the IDF. And there is the issue that it is probably easier to report airstrikes that occur on occupied land. However, the contrasts are quite stark in a world supposedly connected by unstoppable flows of media and all the rest. Begley’s taken the challenge to ‘live tweet’ a @dronestream memoriam of every known drone strike carried out by the USA form 2002 to present. That is the sound of the last ten years of blackberries a’ buzzing. This entry was posted in Uncategorized on November 16, 2012 by lukejh. Radical transparency in modern usage has been defined as an organizational approach or acts that use rapid and abundant networked information flows to access process and outcome data that were previously confidential (see Hammond, 2001, Sifry, 2011). These radical measures are assumed to emanate from within the the organization as voluntary disclosure. To this regard, Kevin Kelly argued in 1994 that, “in the network era, openness wins, central control is lost”, while an explicit argument for “radical transparency” (Bernardi, 2001) was first made in a Foreign Affairs article on information and communication technology driving economic growth in developing regions. Believe it or not, before the internet, radical projects of transparency did exist. The (now) boringly ubiquitous Hansard debates that publish verbatim the voices of Parliament offer one such case. The Open Diplomacy that the Bolsheviks and Woodrow Wilson competed for on populist ideological grounds offers another. Interestingly, both these cases commenced from radical actions outside of the institutional umbrella of government. Radical transparency has a sordid history of being involuntary and unwanted. It also has a history of being incorporated into the conduct of governance. How these two specific historical ‘radical’ acts of transparency folded into institutional governance is not just of historical importance, but provides applicable insights for future movements of government and organizational governance that move away from secrecy in search of what is defined as ‘good governance’. Or at least that’s the notion I’m going to introduce at the Transatlantic Conference on Transparency Research in Utrech in June. This entry was posted in Uncategorized and tagged Bolshevik, Diplomacy, Lenin, Open, radical, transparency, Wilson on April 18, 2012 by lukejh.